Every Board member gets to zoom down an Olympic sliding track at 90mph. And that's just for starters. 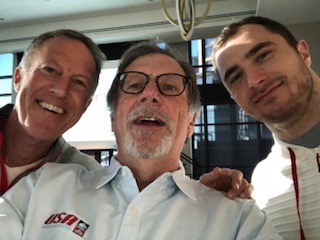 Foundation Board members meet at least twice a year, coinciding with exciting USABS team events. The Winter meeting coincides with a World Cup Bobsled and Skeleton race at a venue selected by Board Members. 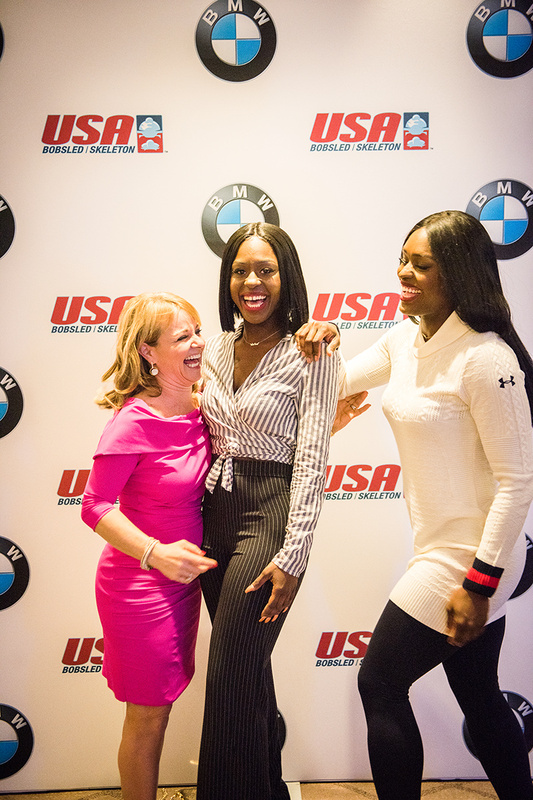 You'll enjoy VIP treatment over the race weekend, prime viewing positions at racetracks, and many opportunities to dine with and get to know the entire USABS National Team. The Summer meeting coincides with the USABS National Team Camp and Annual Gala Awards weekend. You'll spend an entire weekend with the USABS National Team, and get to know the athletes on an up-close and personal basis. Board member spouses, partners and families are most welcome. 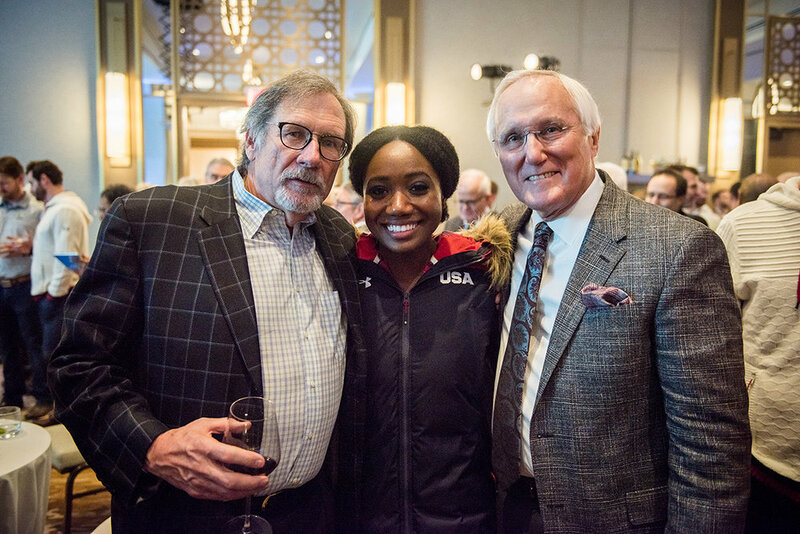 Pete Converse poses with Olympic medalists Elana Meyers-Taylor and Jamie Greubel Poser during the Annual Gala Awards in Lake Placid, NY. 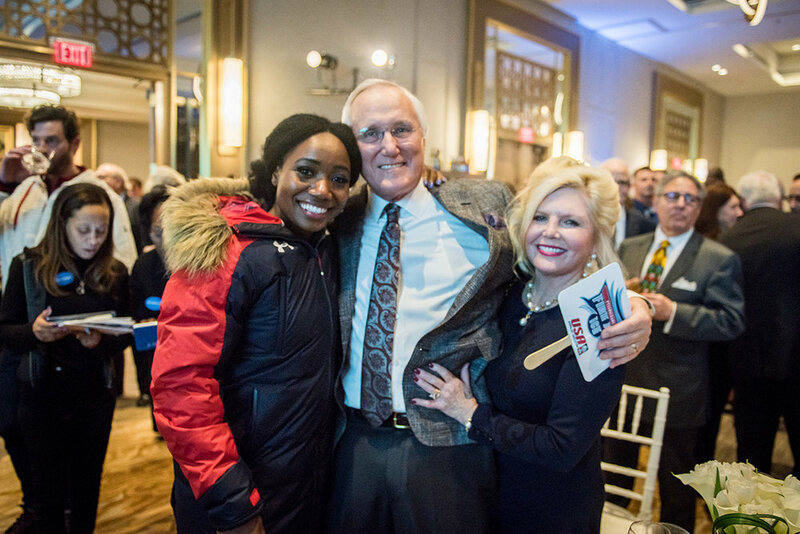 Fran Kirley and Pete Converse flank bobsledder Briauna Jones at the 2018 Pre-Olympics fundraiser in Washington, DC. Foundation Board members also actively participate in fund-raising events with athletes, and current and potential team sponsors at various locations throughout the country. The culmination of a Foundation Board member's experience is seeing our athletes perform on the world's biggest sports stage. You'll have access to preferential event ticketing and seating, VIP travel arrangement services, and a host of other insider benefits. The next Winter Olympics host city is Beijing, China in 2022, which promises to repeat all the spectacle previously on display during their 2008 Summer Olympics. The United States will be throwing its hat back in the Winter host city ring for 2030 consideration, with an expected bid from Salt Lake City, UT. 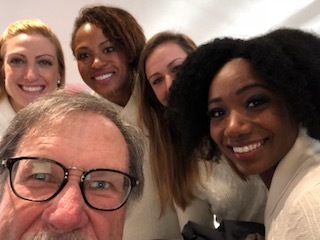 Team USA Bobsled/Skeleton at the 2018 Winter Olympics in PyeongChang, South Korea. No matter where our athletes compete, we are PUMPED for their success!